Congress Vice President Rahul Gandhi said that while the common man stood in long bank queues for days, the rich got their old currency exchanged through the back door. 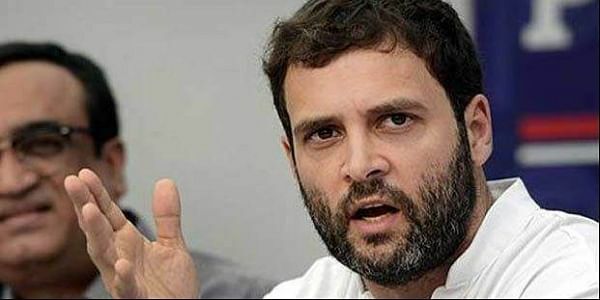 DAHOD: Congress Vice President Rahul Gandhi on Saturday said that demonetisation was a "magical" scheme by Prime Minister Narendra Modi that turned all the black money into white. Addressing the "Adivasi Adhikar Sabha" (Meeting for tribal rights) in this Gujarat district, he said that while the common man stood in long bank queues for days, the rich got their old currency exchanged through the back door. "There is another magic by Modiji and it is demonetisation. You all stood in bank queues, but did you see any suited-booted gentleman standing in the queue? You did not, and I will tell you why," Gandhi said. "It is because all the suited-booted guys entered the banks from the back door, sat in air-conditioned rooms and got their lakhs and crores exchanged. All the thieves thus got their black money converted into white through magic," he said. Modi had on November 8 last year announced the demonetisation of Rs 500 and Rs 1,000 currency notes. Gandhi also attacked Modi over not fulfilling the promises he made to the tribal people. "Modiji did not give a penny to the tribals, but he granted your land, which you call mother, worth Rs 33,000 crore to Tata's Nano project. But the interesting thing is that I do not see any Nano cars on the roads in Gujarat or elsewhere," he said. Gandhi emphasised that the Congress-led United Progressive Alliance (UPA) governemnt had allocated Rs 35,000 crore for the Mahatma Gandhi National Rural Employment Guarantee Scheme that provided sustenance to millions across the country. "And here, Modiji gave this much amount to just one industrialist in one single state. Be it land, be it electricity or be it Narmada's water, everything is being given to just 5-10 select people," he said. Earlier in the day, Gandhi visited residences of Congress Rajya Sabha MP Madhusudan Mistry who has lost his son and that of former MP and AICC Secretary Mirza Irshad Baig who passed away recently, to convey his condolences.